Bianca Capazorio of Capetown, South Africa wrote a fantastic article about a display at the Good Food and Wine show that took place in Capetown last week. Capazorio reported that at first many people were very reserved and were wary about trying the insects, but as the show wore on, those who were more ento-curious and adventurous were excited to try the different insects that were being offered. 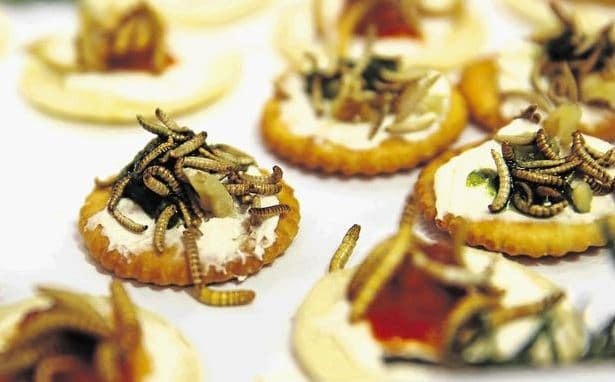 Those who tried eating insects at the show were pleasantly surprised, and commented that the insects didn’t taste anything different from anything else they had eaten. Are you ento-curious? Even just a little bit? Check out the Next Millennium Farms store and start with something like cricket powder that you can add to some great recipes! This entry was posted in Blog, News and tagged cricket flour, cricket powder, eat insects, Entomophagy, healthy eating, insect protein, insects, next millennium farmss, NMF News and tagged buy crickets, This entry was posted in News, worms.